Before recommending some ryokan in Kyoto is good to start by saying one thing, that is that ryokans are places to stay which are usually quite expensive compared to normal hotels, and they also are usually located out of cities or in small spa towns, not in big cities. Often you will come across places that call themselves "ryokan", offering very low prices, and Kyoto is full of this kind of places too. If you are looking for a property and want to try to sleep on tatami and futon these accommodations may be fine, but if your aim is to try an authentic experience of what it means to stay in a ryokan, then I suggest you make an effort, maybe for one night only, and spend a little more. As you can well imagine, Kyoto is famous throughout the world as a "historic city", as the ancient capital of Japan, and it is in the collective imagination of tourists who travel to Japan opposed to Tokyo: on the one hand the modern Japanese capital (Tokyo), on the other hand the ancient Japanese capital (Kyoto). This means that many of tourists travelling to Kyoto want to stay in one of these traditional hotels because they connect Kyoto to tradition (what is a ryokan?). For all said above, ryokans in Kyoto are particularly expensive, not only compared to the hotels but also compared to the ryokan in other cities that are less open to foreign tourism, but if your itinerary includes only Tokyo and Kyoto (and perhaps Osaka), as most of trips to Japan, you do not have many other alternatives. This ryokan is located less than a kilometer north of Kyoto station, and near a metro station (Gojo), a fairly central location. 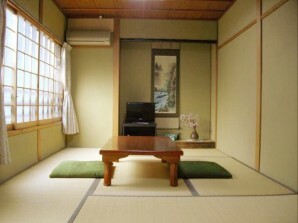 The rooms are all traditional in style and of various sizes, the smallest ones start from 4400 yen per night for one person and 8100 yen for two people. Of course it is not a "real ryokan" in the strict sense, but I consider it one of the best compromises if you want to experience a bit of Japanese tradition and save at the same time, by staying in a convenient area to visit the city. Great location, you can reach Kyoto station by walking for less than 5 minutes. Rooms for two people from 12,000 yen per night, there's a good atmosphere inside, thanks also to a pond with carps at the entrance. Of course it is not a "real ryokan" in the strict sense neither, but, as for the previous one, it is one of the best compromises if you want to experience a bit of Japanese tradition and save at the same time, by staying in a convenient area to visit the city. 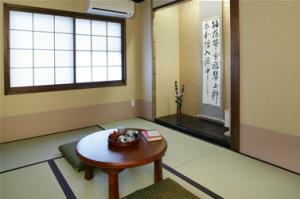 This ryokan is located in a quiet street near the Imperial Park, 300 meters away from a metro station (Marutamachi). 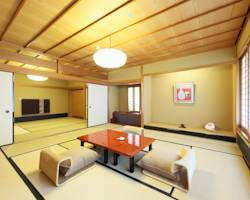 Rooms for two people from 13,000 yen per night. Of course it is not a "real ryokan" in the strict sense, but, as for the previous ones, it is one of the best compromises if you want to experience a bit of Japanese tradition and save at the same time, by staying in a convenient area to visit the city. Very small family-rum ryokan, with a small indoor garden overlooked by the rooms, in a quiet street in Higashiyama, very close to some important temples of the city and 10 minutes from the Gion district. Kyoto station can be reached in about 20 minutes by bus. The ryokan has only two rooms, a smaller one from 11,000 yen per night per person, and a much larger from 27,000 yen per night for two people. The owners are always very kind and very helpful. Here you can try the traditional japanese breakfast for 1500 yen per person. 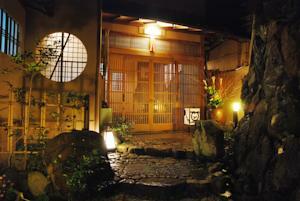 Prestigious ryokan located right in Gion, in front of the entrance to the Shinto shrine of Yanaka. Within this ryokan every little thing is treated in detail to recreate that traditional magic atmosphere that so fascinates tourists coming from afar. Unfortunately you can well imagine that one of the best ryokan in the most famous historical city of Japan in the most famous neighborhood of that city, can only be very expensive. Rates start from about 77000 yen per night for a spacious room for two people, the price also included traditional breakfast and kaiseki-style dinner, the latter is an unforgettable experience. All rooms are equipped with private bathroom, but the there is also a large public bath with traditional views of a garden.